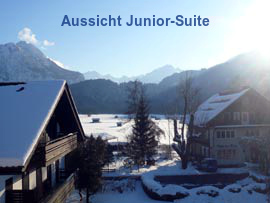 One of the most beautiful holiday apartments in Oberstdorf, in a premium location! 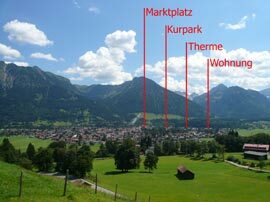 The exclusive holiday apartment "Allgäublick" which sleeps 2-4(5) people is situated just south of the centre of Oberstdorf in quiet parkland surroundings. 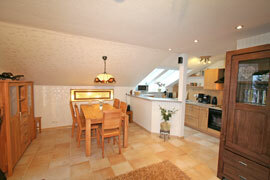 It has a beautiful view of the Allgäu mountains and offers the possibility of spectacular sunsets. It is a 5-minute walk to the town centre and the spa-gardens, and a 3-minute walk to the thermal baths. The mountain ski bus to Fellhorn is just 250 metres away and within 2 minutes' walking from the house the cross-country trails and fields begin. The apartment is ideally situated for those who arrive without a car and there is even a shopping buggy available for guests. The apartment is divided into: a large living/dining room with open kitchen, 2 bedrooms including 1 as a junior suite with inbuilt living room, spacious bathroom with WC, bathtub, shower and double basin, separate guest WC, large west-facing balcony with group seating, deckchairs and BBQ grill. There is a parking space. Full equipment on high comfort level – see below on description. CABLE CARS INCLUDING: From May to November lift-tickets are included in the flats rent. Our guests can take any number of times with the seven major cable cars in Oberstdorf-Kleinwalsertal (Nebelhorn, Fellhorn, Kanzelwand, Ifen, Heuberg, Walmendingerhorn, Söllereck). The savings are enormous: For example, costs just a simple ride on a mountain up to 20€ per person. central but quiet, an own car is not necessary but recommendable. All furnishings are beautifully and lovingly co-ordinated, and the high-quality equipment works in harmony with the natural mountain setting. The entire apartment is tiled beautifully throughout, blending with co-ordinating carpeting. On the large west-facing balcony which has a view of the Allgau mountains, there is the afternoon sun from midday till sunset (midsummer approximately 9pm). The balcony is well furnished with large shade, group seating, deckchairs and BBQ grill. On entering the bright comfortable bathroom with shower, bathtub, double washbasin, WC and opening window, music plays automatically when movement is detected, and if desired there is the option of radio too. 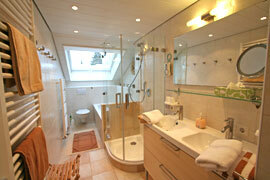 The bathroom is fitted with tasteful, modern fittings such as two towel warmers, vanity mirror and hairdryer. In addition there is a separate guest WC. A view of the Allgau mountains can be enjoyed from the living room, where the living area is well equipped with natural wooden furniture, sofa and Dolby-Surround Home Cinema. The beechwood dining area co-ordinates beautifully with the white, cream and brown of the living area. The open plan, beechwood kitchen is separated from the dining area by a breakfast bar and caters for every possible desire: dishwasher, microwave, 4* freezer compartment, rice cooker, waffle iron, mixer, toaster, kettle, coffee maker, espresso machine and standard cooking utensils. The red bedroom is furnished with a romantic touch and white wooden furniture such as wardrobe and chest of drawers. There is also TV, DVD/CD/Radio with USB, additional seating and coat rack hanging space. The four-seasons bed system provides a comfortable temperature all year round. The junior suite is divided into a bedroom and separate junior living room. The bedroom is furnished in modern oak and also has the four-seasons bedding system. The junior living area has an especially pleasant atmosphere with its south-facing sunny view of the fields and mountains through large roof windows. 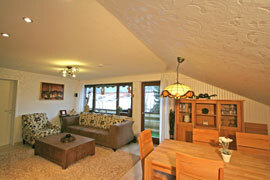 The living area is furnished in natural beechwood and has a convertible sofa and recliner chair. There is also a TV, DVD/CD/Radio and a mini library area. 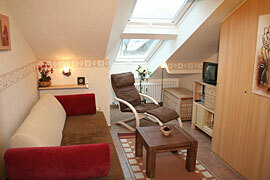 Occupancy: The apartment easily accommodates 2 – 4 people very comfortably. On request it is possible to accommodate a 5th person by means of the convertible couch in the junior living room. 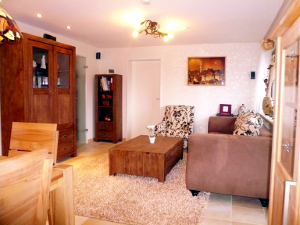 The apartment is suitable for families and also two couples, especially as there are two separate living areas available. The facilities available include: 3 x TV, Home Cinema, 2 x DVD/CD/Radio with multimedia USB connection, mini-safe, hanging space, shopping trolley, assorted music CDs and film DVDs. In winter there is a sledge available, and further baby equipment is available if required. In the basement there is use of the coin-operated washing machine, drying space as well as space for ski equipment. A dedicated parking space is at the front of the house.